1Turn off and unplug all the computers. All of them that are going to be connected to your soon-to-be network should be unplugged. 2Turn off all the computers’ peripherals. This includes printers, monitors, modems, and anything else that’s attached to any computer. 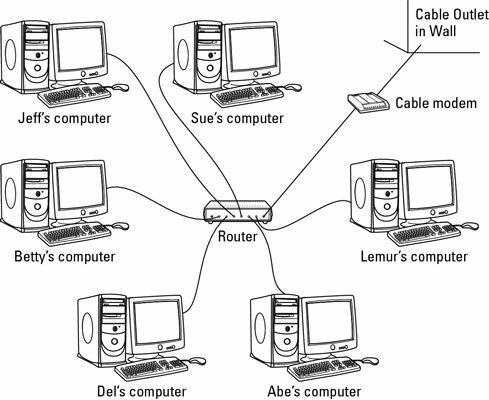 4Replace the computers’ cases, if necessary, and connect each network cable between the computer’s adapter and the router (or switch). 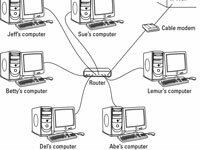 5Plug the modem into the router’s WAN port if you are a broadband Internet user. 6Turn on the computers and their peripherals. Turn on the computers and their monitors, printers, modems, and whatever else happens to be connected to them. 7Select a location for your network. When Windows Vista wakes up and notices the newly attached network equipment, it asks you for your network’s location: Home, Work, or Public Location. Choose whether you’re working at home or work (safe) or in public (less safe), and Vista automatically adds the proper security level to protect you.